Shopping and champers. Double delight! Last night, Times Square, Avion Way, Claremont was all lit up party-style. It was a VIP Shopping Night and there were loads of special offers, coupled with bubbles and nibbles for all! The party started in ‘PoppyLand’. 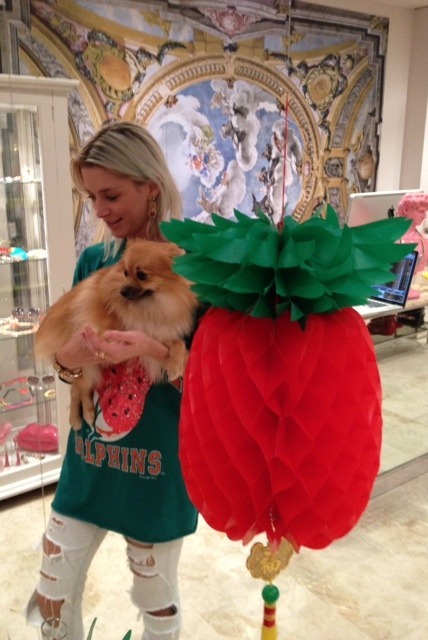 Designer, Poppy Lissiman has created her own ‘world’ within her Times Square store. It’s an eclectic mix of clothes and accessories, with a ‘hip’ bohemian feel. To celebrate in PoppyStyle, poochy came along too. Yes… I’m in ‘dare to wear’ AndAndrea heaven! A kaleidoscope of colourful treasures at Poppy Lissiman. 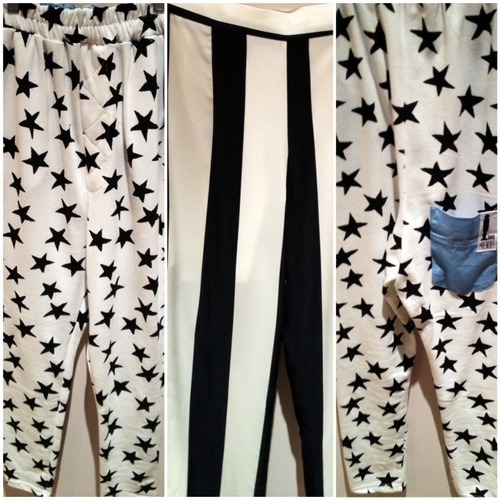 Stars or stripes… take your pick, at Poppy Lissiman!! Time to move on. Next stop, Leona Edmiston. Kisses and hugs all round with my Leona gal pals, Renee and Kylie (Top L). 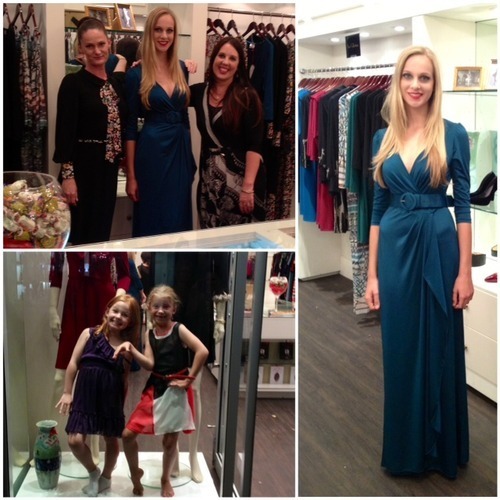 Daisy (R) modelled an elegant, teal, wrap dress. Classic Leona. Look in the window! (Bottom). 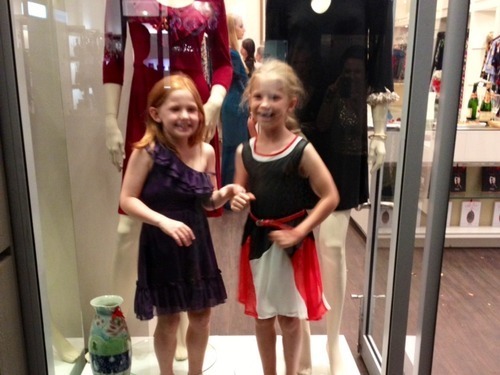 Two adorable, mini-manni’s, dressed in Little Leona. The party at Times Square continues… time to glam up at Ruth Tarvydas’ new abode. Champers, tiaras, beaded gowns and cocktail dresses. Oo La Laaa!! It’s Party Central next door, at Ten@Times Boutique. 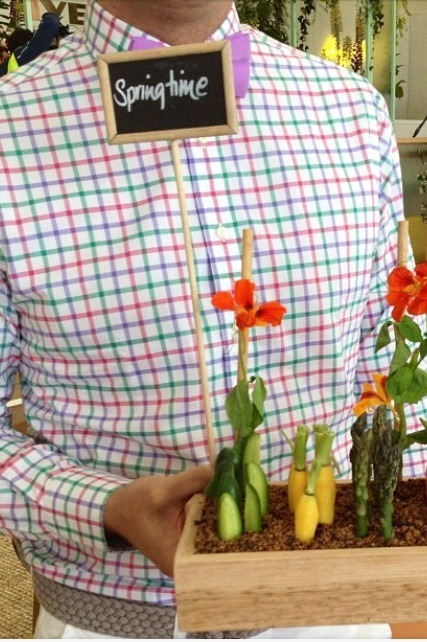 This store showcases ten of the best, new, W.A. designers, all under one roof. 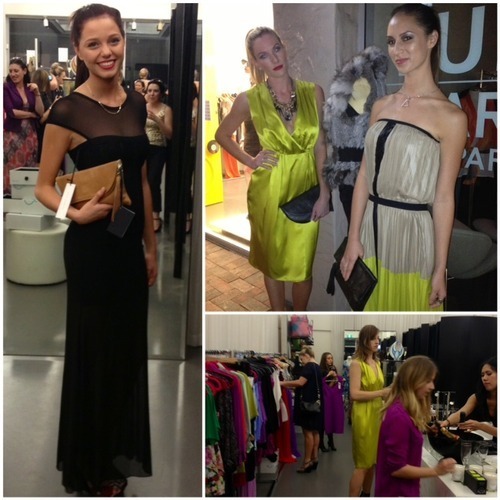 Here, you’ll find gorgeous dresses from Kim Barton, Rosie and Broken and Jomay Cao (Above). Leather goods from Sarah Zel Chescoe, Shoes by Zamora, Katherine Dunmill cuffs and collars, and bathers by Cebiche. From shoes, to bags, bathers to dresses, cuffs to clutches, it’s all at Ten @Times Boutique. YES! They are real!! The ‘live’ mannequins in every store or window were from Alpha Models. Bree and Tamsyn above, changed outfits and poses throughout the night and did a sensational job. Tamsyn (L) wears a Rosie and Broken dress. Bree (R) wears Kim Barton. Zamora shoes. Sarah Zel Chescoe clutch. 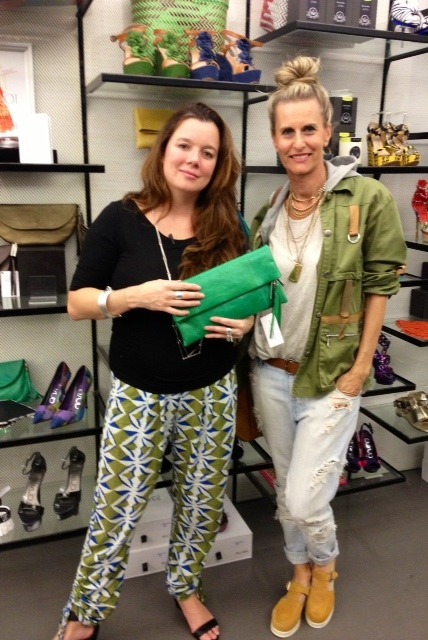 The party continues with designer Sarah Zel Chescoe at Ten@Times. She’s so passionate about her leather creations. Her pouches, bags and clutches are made from soft, kid leather and feature detachable tassels. My Shop-A-Thon wound up at Recollections by Lost Souls. 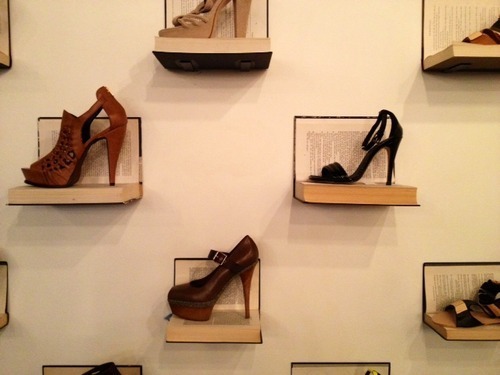 A book-shoe wall feature… now that’s different! Lost Souls is an interesting combo. It’s like two stores in one! 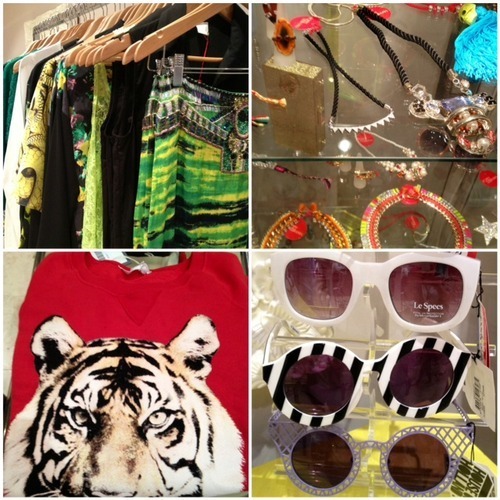 On one side, you’ll find high-end recycled, designer clothes and leather goods from Recollections Boutique. 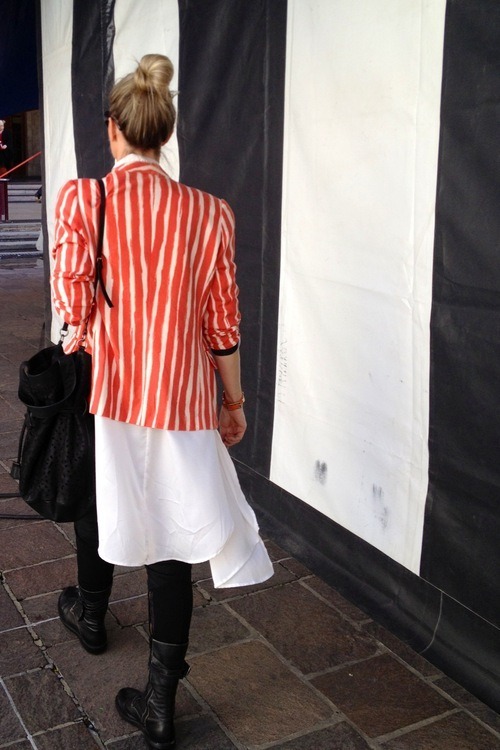 On the other side you’ll find edgy, WA labels such as, Zhivago and Ange Lang. Caitlin (Above) models a Zhivago tunic, featuring their signature statement shoulders. So much fun… but the party’s over and it’s time for these lil Miss Leona’s to head on home. Do pop down to Times Square, Avion Way, Claremont for a fab shopping experience and a Lemon Lane cuppa.